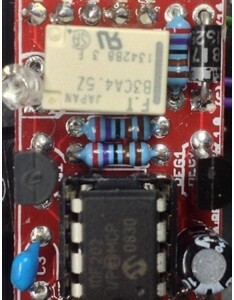 Microcontrolled Relay-true-Bypass with MUTE feature. Signal is muted while switching – noiseless. I used this to make the reverb on my Fender Princeton Chorus foot switchable without running the reverb signal through the foot-switch. 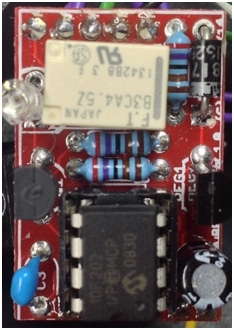 The relay unit’s voltage is regulated down to 5VDC by a 78L05, so you can use a higher voltage than 9VDC. I ended up using the 16VDC rail in my amp. 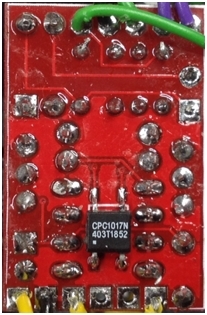 I used the relay to ground the reverb return signal at the PCB. The unit is small and it was easy to find a spot to mount it in my amp. It functioned flawlessly.